The Viaje White Label Project (WLP) Winter Classic is the fifth blend released in Viaje’s White Label Project (WLP) series. The White Label Project was launched about a year ago and has been deemed a series of experimental blends by Viaje. In terms of this series, there have been some hits and there have been some misses. In the case of the candela-wrapper release, the Viaje WLP Candela, it ended up finishing as our #28 Cigar for 2011. In the case of the Viaje WLP Stuffed Turkey and Viaje WLP 50/50 Red, we felt some more work in the “lab” was needed on those blends. 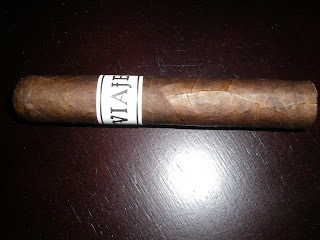 With the case of the new Viaje WLP Winter Classic, this turned out to be a very flavorful cigar. In fact, this might be one of the better blends that has come out of this series. The Viaje WLP Winter Classic underscores a point that has becoming an evolving theme with the 2012 cigar year – the trend toward shorter-sized smokes. These smaller cigars seemed to be aimed at the winter months where folks are often smoking outside and cannot do a long smoke due to colder temperatures. Viaje has been at the forefront of this movement for a while. If you look at all of the batches they released, Viaje is probably the company that has the highest percentage of cigars 5 inches or less. The Winter Classic fits perfectly into the trends in both the industry and Viaje as a company in that this is a 4 1/2 inch Rothschild vitola. When we previewed the WLP Winter Classic a couple of weeks ago, the picture of the packaging indicated that there would be 250 bundles made available to authorized Viaje retailers – usually translating to an average of 1 to 2 bundles per retailer. Each bundle contains 25 cigars. Let’s take a closer look at the Viaje WLP Winter Classic and see what it delivers during the smoking experience. Consistent with the Viaje WLP series, there is a single vitola with the Viaje WLP Winter Classic – a 4 1/2 x 48 Rothschild size vitola. Of all of the wrappers in the Viaje WLP series, the WLP Winter Classic definitely has the best looking wrapper. I would describe it as a coffee colored wrapper. It is dark brown, but not “maduro/oscuro” shade by any means. The wrapper itself is mostly smooth, but there are several visible veins. The band is the usual “White Label Project” band – namely a white background with “Viaje” visible boldly in black font. There is a thin black pinstripe at the top and bottom of the band. For my Viaje WLP Winter Classic, I opted for a straight cut into the cap. The pre-light draw was not the most exciting. It was mostly woody with a hint of cedar spice in the background. While I wasn’t satisfied with the pre-light draw, it doesn’t factor in to the final assessment score so there is no loss of points here. It was now time to fire up my WLP Winter Classic and see what this cigar would bring to the table. The initial draw of the Viaje WLP Winter Classic provided some more of the wood notes that I got on the pre-light draw. It also provided me some pepper spice which was in the forefront with the wood notes. The pepper spice was not quite a full-scale pepper blast, but more like a “small burst”. It subsided quickly and moved toward the background. It was in the first few minutes where some cherry sweetness also emerged. Around the five percent mark, the wood transitioned to more of a milk chocolate taste. These chocolate notes started out in the background, but by the 20 percent point, they would be on-par with the cherry notes in the forefront. It was now at this point where the cherry, chocolate, and pepper notes would alternate as to which flavor would be the primary note. In this scheme of alternating notes, the pepper was the flavor that was least in the forefront. This continued through the first two thirds of the smoking experience. In the last third, the chocolate flavors moved into the background and it was the cherry and pepper that would become primary. As the cigar reaches the nub, the cherry sweetness also moved to the background and it made for a spicy finish. The finish to the WLP Winter Classic was not harsh and the nub was cool in temperature and firm to the touch – an ideal finish. As I have mentioned, I felt some of Viaje’s 2011 releases were “green” and needed about 8 to 10 weeks of aging. From a flavor standpoint, the WLP Winter Classic did not feel “green” as the flavors seemed developed. From a burn standpoint, this was a solid burn that also did not show any signs of “green”. For the most part, the burn was straight and required minimal touch-ups. The burn temperature and burn rate were ideal. The resulting ash was more blackish than I would prefer, but this has been something I’ve seen with Viaje cigars whether they required more aging or not. The draw seemed much tighter than I preferred. I chalk this up to more of the way the cigar might have been packed as opposed to lack of aging. Lately, the Viaje portfolio has been leaned toward many full strength (i.e. heavy on the nicotine end) offerings such as Skull and Bones and Super Shot. The WLP Winter Classic is not going to fall into this category. I assessed this as being medium in strength (and just short of being medium to full). As for the body, the depth of the flavors start out subtle and progressd to being more robust. I assessed the beginning of this cigar as being mild to medium in body, progressing to medium to full by the midway point. In any assessment, I try to make sure each cigar stands on its own and comes in with a clean slate. Given I had less than stellar experiences with the Viaje WLP 50/50 Red and Viaje WLP Stuffed Turkey, I was a little concerned about what the WLP Winter Classic would bring to the table. Still I went into this assessment with a clean slate. The end result is the WLP Winter Classic treated me to a very good smoke. With word of returns of the WLP Candela and the WLP Stuffed Turkey for 2012, I’m sincerely hoping the WLP Winter Classic returns in 2013. While I mentioned I did not think this cigar needed age, I’m curious if this cigar still will get better with age. Time will tell whether or not my draw issues are a widespread problem. This is a nice cigar to introduce the new cigar enthusiast to the Viaje brand. Exprienced cigar enthusiasts will certainly appreciate the flavors this cigar brings to the table. As for myself, this is a cigar I will be smoking again.